With his famous declaration in the 1970s, the former King of Bhutan challenged conventional, narrow and materialistic notions of human progress. He realized and declared that the existing development paradigm – GNP (or GDP) – did not consider the ultimate goal of every human being: happiness. Old Wisdom for a Modern Age! Perhaps inspired by age-old wisdom in the ancient Kingdom of Bhutan, the fourth King concluded that GDP was neither an equitable nor a meaningful measurement for human happiness, nor should it be the primary focus for governance; and thus the philosophy of Gross National Happiness: GNH is born. Since that time this pioneering vision of GNH has guided Bhutan’s development and policy formation. Unique among the community of nations, it is a balanced ‘middle path’ in which equitable socioeconomic development is integrated with environmental conservation, cultural promotion and good governance. For over 2 decades as Bhutan remained largely isolated from the world, GNH remained largely an intuitive insight and guiding light. It reminded the government and people alike that material progress was not the only, and not even, the most important contributor to well-being. 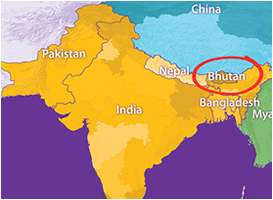 As Bhutan increasingly engaged with the global community, joining international organizations, substantial efforts were made to define, explain and even measure GNH. Indices were created, measurements were recorded and screening tools for government policy were created, and the second phase in the development of GNH saw its practical implementation in government become a living reality. The Folly of the GDP obsession! The folly of an obsession with GDP, as a measure of economic activity which does not distinguish between those activities that increase a nation’s wealth and those that deplete its natural resources or result in poor health or widening social inequalities is so clearly evident. If the forests of Bhutan were logged for profit, GDP would increase; if Bhutanese citizens picked up modern living habits adversely affecting their health, investments in health care systems would be made and GDP would increase; and if environmental considerations were not taken into account during growth and development, investments to deal with landslides, road damages and flooding would be needed, and GDP would increase. All of these actions could negatively affect the lives of the Bhutanese people yet paradoxically would contribute to an increase in GDP.